As the number of young people with cancer continues to grow, we want to help equip other physicians and clinicians with the ability to comprehend that young adults with cancer have different challenges than other populations with cancer. Many challenges affect diagnosis and treatment. A young adult may not act on symptoms of cancer because it is uncommon. Some symptoms may be similar to the symptoms on noncancerous conditions. Young adults may not have health insurance, or they have limited financial resources to pay for cancer treatment even if they have health insurance. Many young adults have no previous experience receiving care for a complex diagnosis. As such, they may have trouble navigating the health care system. Young adults also have a wide range of emotional, physical, and social concerns, including relationships, sexuality, parenthood, education, and employment. This activity will directly address those challenges and give the participants strategies to over come them. Learn more by visiting the Chicago AYA website here. This activity is designed for physicians and other healthcare professionals dedicated to the treatment of adolescent and young adult cancers. 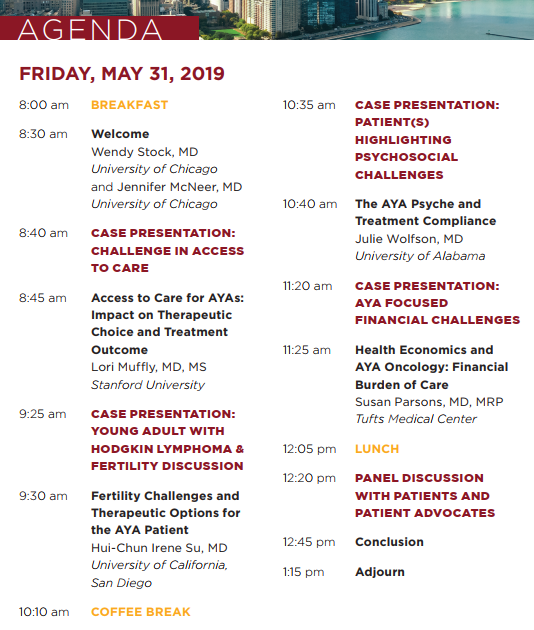 Analyze how compliance affects outcomes in AYA patients. Click here to learn more about The University of Chicago Gleacher Center! ACCESSIBILITY The University of Chicago is committed to providing equal access appropriate to need and circumstances and complies fully with legal requirements of the Americans with Disabilities Act. If you are in need of special accommodation, please contact our office at 219-465-1115 or via email at support@meetingachievements.com. The University of Chicago Pritzker School of Medicine designates this live activity for a maximum of 3.75 AMA PRA Category 1 Credits™. Physicians should claim only the credit commensurate with the extent of their participation in the activity. Registration: Click the button below to get started!